This volume of 36 original maxims mimics a spool of ribbon from a sewing shop. The maxims, one for every inch in a yard, are woven, not printed, on a computerized loom. The letters are red on a white ground, with reverse tones on the verso. The ribbon scroll has two joins, sewn on a sewing machine, with ironed folds to evoke the folds of banners or scrolls with titles or mottos, often with latin text, found in paintings, crests and seals. The typeface is san-serif to increase the legibility of the woven letters, but the upper-case initial letter of the first word in each phrase is in a Roman type approaching Palatino. The titling on the cardboard spool itself is genuine Palatino, designed by Hermann Zapf. It was based on Renaissance letterforms which in turn reflected Ancient Roman chiseled lettering, when both serifs and maxims were very popular. One of the maxims on this roll, “Good messages bear repeating, not plagiarizing” relates both to the Palatino typeface and Hermann Zapf’s career. Good messages, verbal and visual, have always appeared in history. The existing record of human creativity makes it impossible to be entirely original. But every epoch needs its bards and good ideas bear repeating. Zapf, a highly gifted, self-taught calligrapher and type designer was greatly disheartened to see his influence deteriorate into plagiarism: Palatino is known by many different names in type catalogs and computer programs all over the world, with no royalties or recognition to the man who created it. The initial letters are not only distinguished by being a different typeface, they are also larger than the letters that follow, and are woven in bold type. This is to convey the idea of a rubric, which is a distinctive initial letter or heading usually in red lettering. A rubric is also a rule or instruction in religious texts and law codes. Maxims are similar, in that they attempt to express fundamental principals, as well as rules of conduct, in a concise manner. The maxims here are heartfelt opinions, autobiographical musings and human observations. Some are intended purely to amuse, but all spring from truth. 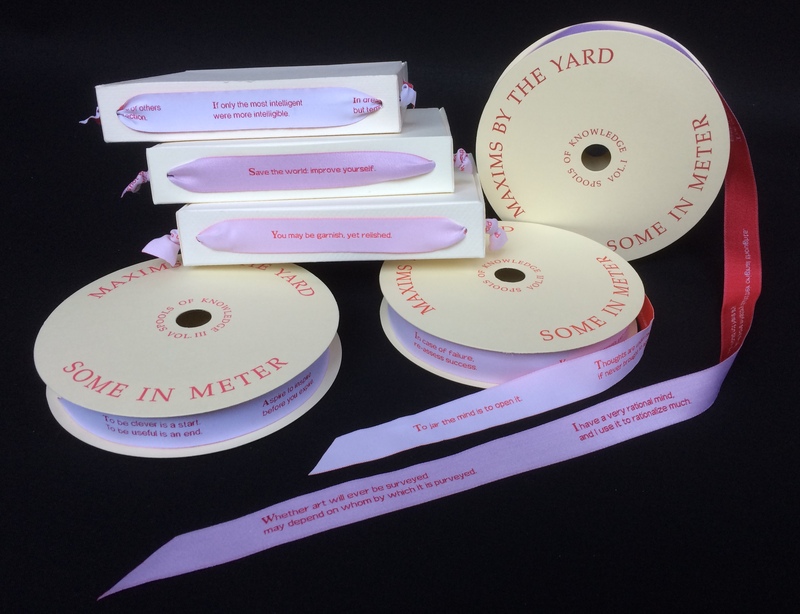 A number of the maxims are composed in rhyming couplets or metric verse, which is why “meter” figures in the title. That is also why there are precisely one hundred copies in this edition; one for every centimeter in a meter. Spool title printed at Stamperia Valdonega of Verona on acid-free cardstock manufactured by Cartiere Fedrigoni. Spool die-cuts created and executed in Bologna’s industrial quarter. Ribbon woven in Carpi, Italy. 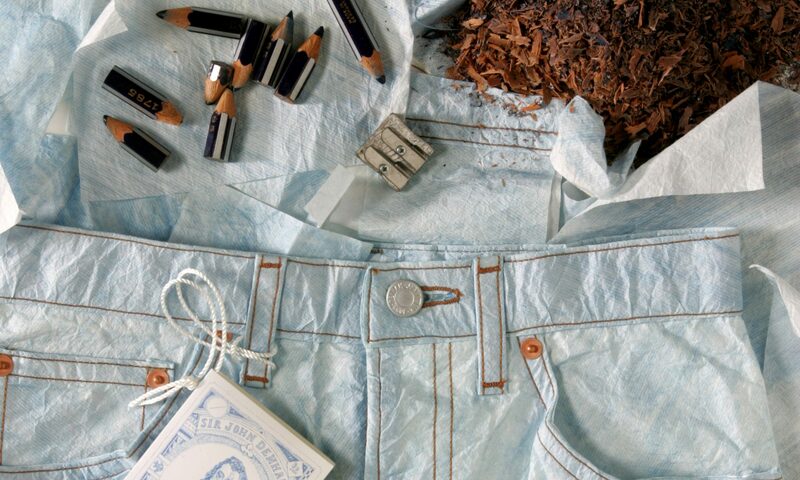 Sewing, ironing and cylindrical forms carried out by the artist. The volume is stored in a non-adhesive cardstock clamshell box, with one woven maxim, visible on the spine, used to bind the clamshell together. may depend on whom by which it is purveyed. and I use it to rationalize much. we would not have any. pass it on before you do. might not publish, but won’t perish. I am a conscientious observer. than the will to carry them out. for the injured will be armed with license to offend. than to be at hand and out of mind. but I’d rather not die in one. Writers create their own sentences. but no more deserving than any other. but not the best people. I try to be faithful. unless you are only young inside. it’s what you imbue it with. Save the world: improve yourself. which in time becomes history. our creator must have felt the same way. I would be on the relay team.